Blackmagic Design released the first public beta of Resolve 15, to which they've added a Fusion tab so that VFX work can be done without ever leaving the editing environment. Obviously, that's going to put Fusion in front of thousands more eyes, and given that I'm writing a book about it, that seems like good news to me! So it behooves me to try it out as early as possible. Now, given that I'm a reasonably advanced user of Fusion, it's to be expected that I'll hate a lot about trying to use it in the context of Resolve. I really have no interest in being an editor, so my inclination is to resist wrapping my software inside an editing program. Keep that in mind if I get overly negative. I'm sure for editors who want to dabble their toes in effects, it's the Best Thing Evar. First thing to hate: I can't just click over to the Fusion tab and start going. Apparently nothing in there works unless there's a clip on the timeline in the Edit tab. Okay, well, maybe I can just make a black slug to build fresh Fusion comps on top of. The slug will still need to be imported to the Media Pool and added to the Timeline before I can start playing, though, and that's a big pain. Ah well. I'll pull in a cut ref from the show I'm working on—that's a pretty good way of testing the advantages Resolve will give me. I cut that up into shots and then switch over to the Fusion tab. Now my reference is coming in on the MediaIn1 node, which is handy. I don't intend to send that downstream, but I always want to have it in my Flow, so I'm essentially getting it "for free." Here's another problem, though: I need to work with handles. If I just use the sliced-up cut ref, my shots will only be the length of the shots—that's no good; client aren't going to accept shots without handles. Fusion Connect apparently has the same problem. I think there's a solution here, though. I can make a second video track and move my VFX shots there. I don't know if there's an easy way to just add ten frames at each end of the clip. I can't seem to type in the timecode field to position my playhead, so for now I'll content myself with using the arrow keys to nudge the playhead and Trim mode with snapping to lengthen my clip. If the Fusion clip's already been generated, adjusting the clip in this fashion doesn't update it, but if you do it before you switch to the Fusion tab it works as expected. So great; we can work with handles! And taking the logic in reverse, we can trim the handles in the Edit page without removing them from the Fusion comp, so that actually works better than I'd expected. The next thing I want to do is to add some CG render passes. 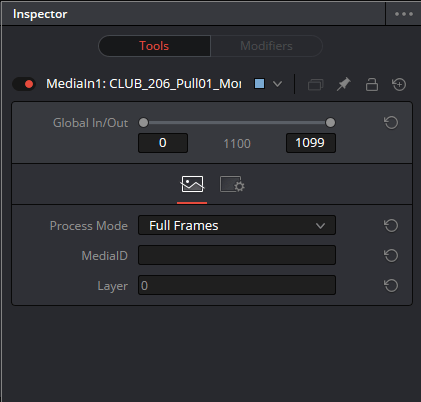 So in typical Fusion fashion, I Ctrl+Space for the Add Tool dialog and grab a MediaIn node (there are no more Loaders, which is going to wreck most of my scripts, but I can deal). Um… how do I choose a file in this thing? There's no filename field! Okay, method #2 is to find the file in Windows Explorer and drag it in. Okay, that seems to have worked… but. Putting in the Viewer doesn't show anything. Global In/Out are set to 0/0? Two problems with that: This clip starts at frame 579… okay, three problems with that. This client requires all comps to begin at frame 1001, so I'm going to need to find a way to renumber the output. Preferably I'd be able to renumber the inputs, too, so I can easily sync everything together. But even if that's not in the cards, I at least would like my new images to come in at the Global In point for this comp, not for the entire project. Alright, well I'm sure that can probably be fixed easily enough; this is beta software, after all. Okay, so how do I get an image sequence in here? Multi-selecting everything in the folder seems to get the job done. I'm sure that's another quirk that can easily be ironed out, so it doesn't seem worth pitching a fit over. So now I have my CG in, and I've set the Global In/Out so that it covers the time I require. It's a linear image, though, so I really should be looking through a LUT. Where the heck is my LUTs button? It seriously took me several minutes to find it. Turns out that if the filename in MediaIn is too long, it pushes the buttons right off the edge of the Viewer. Once I actually found the LUT button, its icon looks more like it should turn on guides or a grid (you can see it above the left-hand Viewer in the screenshot below), but it seems to work, and Resolve comes with a lot of LUTs built-in. In contrast to Fusion 9, where most of the useful ones had been removed, Resolve has so many that it took me a while to find one that would convert lin to sRGB. Shortly after I figured out the LUT, I brought a second pass of CG in and tried to Merge my two passes together by connecting their outputs. Resolve crashed. Okay, fine, Fusion crashes, too. But I'd forgotten to set the Autosave time to something other than the ridiculous 10 minutes of the default. Well, I'm not going to redo everything I've done so far, so I'll keep my next steps simple. I pull in my media again, set their In points, Merge them successfully this time, and try to view the result. Resolve crashed. … beta software. Must remember this is beta software. But it's certainly going to be difficult to evaluate it if actions as simple as Merging and viewing images cause it to crash. Well. I'm out of time for tonight. First impression: Too crashy to evaluate. I think there's some real potential here, though. I already see some things I like and some places where some improvement can happen immediately. I'll definitely keep experimenting and sharing my opinions on the beta test forum. Let's call me cautiously optimistic. Just the fact that Resolve is now scriptable is a huge step in the right direction. Work has already begun on creating Reactor for Resolve, and I've got it on good authority that Blackmagic is keeping the pro VFX market in their sights. It's a couple of days after I posted my initial impressions, and I've had the chance to play a little bit more. Not a lot, but enough to sort some things out. The frequent crashes were related to my GPU. There's an option in the main Resolve Preferences (available under the DaVinci Resolve menu) to force Fusion to run only on the CPU. Turning that on stopped most of the crashes. In addition, the program actually runs on the ancient Pentium loaner machine I have at home right now. It doesn't run well, but it runs. I can at least get screenshots for the book, even if I would never be able to do any actual production here. Version control seems like a thing that will be difficult to do with ReFusion. If you start a Fusion comp by just switching over to the tab, there appear to be limited options for storing it should you want to come back to it later. If you make a new Fusion Clip after having started, it appears as though Resolve will simply destroy your previous work and replace it with a fresh comp. Less than ideal, I should think. If you started properly by creating a new Fusion Clip and want to make a new version by creating a second Fusion Clip, you'll be starting over with a fresh canvas, so you'd have to copy and paste your previous node tree. It's evident that versioning wasn't something that was considered. Fortunately, it's possible to import and export Fusion comps, so at least you can stash your work and handle versions outside the program. With some scripting and a bit of exploration of the database, I think it might even be possible to build a version control mechanism that works without having to rely on that clunky workflow. Even once comp versions are sorted, there's still the matter of being able to review and compare those versions in the Timeline. Generation had a beautifully elegant solution, with versions stacking up vertically over a timeline. You could move up and down the version stacks with hotkeys, or even display all the versions at once in a grid layout. I'm not sure how that would work in the context of Resolve's timeline—maybe a utility Track at the top of the edit Tracks. Resolve's UI is already pretty full (not helped by their liberal use of whitespace throughout the interface), so maybe adding yet another full-width element like that would be pushing it. If comp versions could also be linked to displayed versions, you could quickly look at a version, annotate it, then immediately dive into that version of the comp, save a new version and do some tweaks, and then back out to Edit to view your changes with the rest of the cut. It sounds like a wonderful way to work—fast, yet non-destructive. thanks for this very useful and thoughtful initial take. it will be very interesting to hear from you whether you think BMD take notice of what you say and fix any of the specific things that you mention. in a perfect world they would talk to you directly. i am really hoping that BMD is indeed focused on the pro market, because there is not enough challenge to the dominant (expensive) players. do you know whether BMD is going to continue developing Fusion as a standalone product? According to a discussion I had with an insider recently, there are no plans to discontinue development on RealFusion. Apparently the code is the same, so the overhead of supporting it in two products is relatively small. I actually do have a couple of different channels for direct communication. Granted, one of them is marketing, so that's of small benefit for guiding the product. It's going to be important that professional users make a point of being active in the beta forum so we're not drowned out by the prosumer crowd. While it's great that the one-man-band kind of user is getting such powerful tools, we need to make sure that Fusion continues to be useful to larger pipelines, too. One concerning matter is that moving it into Resolve makes it less flexible. The addition of scripting makes me hopeful that BMD sees the benefit in allowing TDs to customize. I *hope* that they're working on an SDK. There's a document about developing OFX for Resolve in the help materials; I'm taking that as a good sign. Have you tried loading multi-layer exr into Dafusion yet? I haven't seem to find away to isolate render passes. It doesn't look like channel selection from a MediaIn is supported yet. I've put a comment on the beta forum about it. It's also not possible to export an EXR with channels other than RGBA. As far as handles go… I have been thinking a lot about the way the Fusion inside resolve is currently working. At first my inclination was to set up a fusion clip so that I could define handles. Then it hit me that by default creating a fusion comp on the timeline gives you access to the whole file. So you can work on more than just the render range and effectively have your handles. Resolve has a great feature in the deliver page to render out individual clips from the edit and you can include handles at that point too. I would like to see an easy way to adjust that view range selector to zoom into the render range so that it is easier to control your timeline.